LIFT Festival 2018 is seriously impressive in terms of accessible, groundbreaking programming, with a real flair for engaging the communities of London and the world. Don’t miss the final fortnight! A scream-fest-fun-fair-ride of a show, exploiting pure fear for 40 horrifying minutes. From furry, clawed creatures popping out from behind pillars to murderous, nightmare-inducing clowns, Phobiarama is not for the faint-hearted. 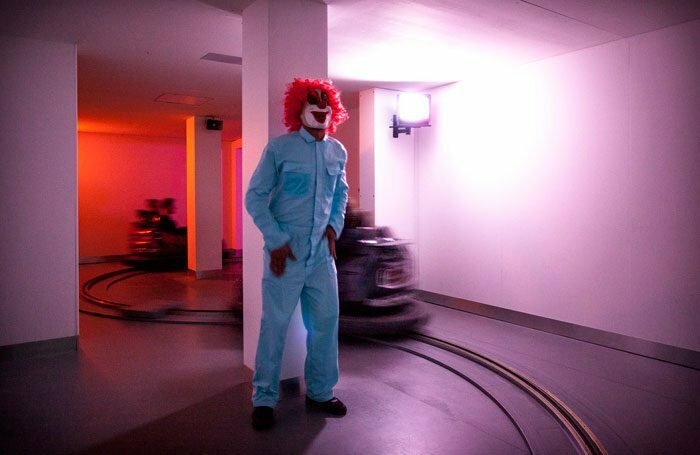 Once you enter the black marquee and get assigned bumper car (to share if you’re lucky enough to have someone to cling on to), the fear begins to race through your veins. From pitch black to intense flickering light and noise from CCTV screens, the whole experience is a sadistic wonder of technology. The exploration of fear of the ‘other’ – and particularly people of colour – is brought to light with no holds barred. Just when you think you’re safe this earth-shattering performance installation knocks the wind even further out of you. Breathtaking! Thamesmead’s Crossness Pumping station is a Victorian wonder of engineering – albeit quite a stinky one! The invention of Sir Joseph Bazalgette in 1865, the station aimed to tackle ‘The Great Stink’ of the Victorians with a series of inventive pumping systems. A tasty pre-show dinner of chow mein (worth the wait!) and rice was a great way to relax in the slightly surreal environs. Once the gates to the performance area – by the Thames – open, the audience is free to sit on a patch of rough grass (or, if you’ve gone for the pricier tickets, a seat in the bleachers) eagerly awaiting the pigeon performance artistes. Once darkness falls, a symphony of flying friends fill the skies above. The LEDs attached to their feet (we’re promised no harm is done) create a visual feast of swirling stars, like a trippy, firework display or a monochrome iTunes visualisation. The unloved pigeon truly transcends its filthy stereotype to perform an aerial ballet of epic proportions – just beautiful. We expected this mash-up of dance & live music to feel a little amateur – but we were so wrong! The energy and extreme attitude of the nearly all female Steppaz dance crew, paired with the banging sounds of Empire Sounds, really swept us away. The complex choreography, unstoppable spirit and commitment of these young performers is beyond impressive. The show ends with a street dance party vibe, with audience and performers merging into a frenetic carnival of life and colour. Life affirming! ← £5 Tickets for SESSION, Part of LIFT 2018!